Yes, I know, it’s supposed to be “Long Live the Queen” but in the case of hornets, the term “long” is relative. 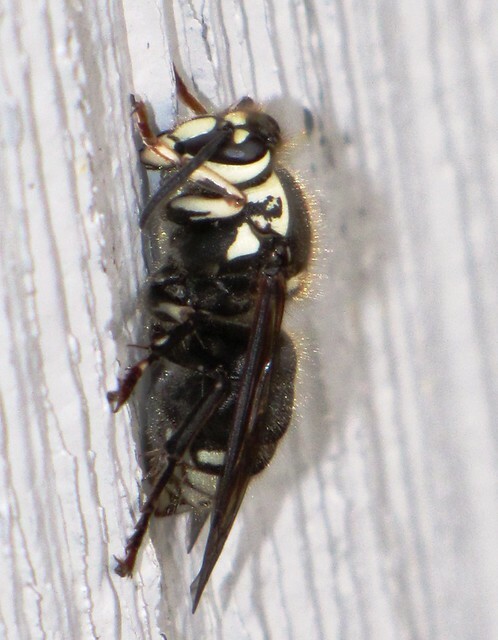 A queen Bald-faced Hornet is lucky to live a little over a year – and to do so she has to sleep through half of it. Considering that the average life of a run-of-the-mill worker Baldie is closer to three months, of course, her reign is considerable. Perhaps “Longer than average live the Queen” would be a more appropriate phrase. Late autumn is the time when a hornet queen is forced to keep a stiff upper mandible, so to speak. By the time the first killing frosts hit, the entire colony will be dead. There may be 500 individuals in a typical “hive” by late summer and they nearly all perish with the autumn leaves. This includes the old queen as well. Before the old gal kicks the bucket, however, new potential queens are produced from her generous supply of eggs. These virgin queens do not remain chaste for long. They are quickly mated and thus prepared for the next crucial stage in their lives. The newly minted, and fertilized, royalty are the only colony members that will survive winter. At this point in the discussion I should interject a few crucial points for the sake of accuracy. 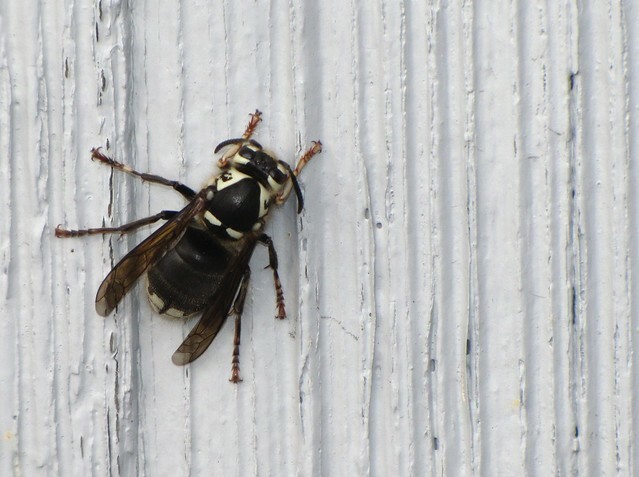 First of all, the name of the Bald-faced Hornet is a bald-faced lie of sorts. 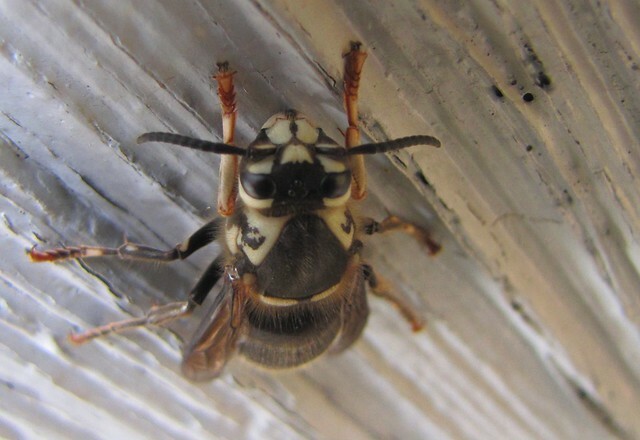 These large black wasps are endowed with ivory white markings including a full white facial mark – so the bald-faced part of the name is true enough (you might remember from earlier blogs that the term “bald” means white). But, because these hornets are not true hornets there is more than a bit of falsehood in the name. Technically they are members of the Yellowjacket clan and are designated as “aerial yellowjackets.” This latter term may seem perplexing at first given the fact that all yellowjackets are aerial (all fly directly into your face when you are eating outside in the fall, for instance). The term is more specific than that. 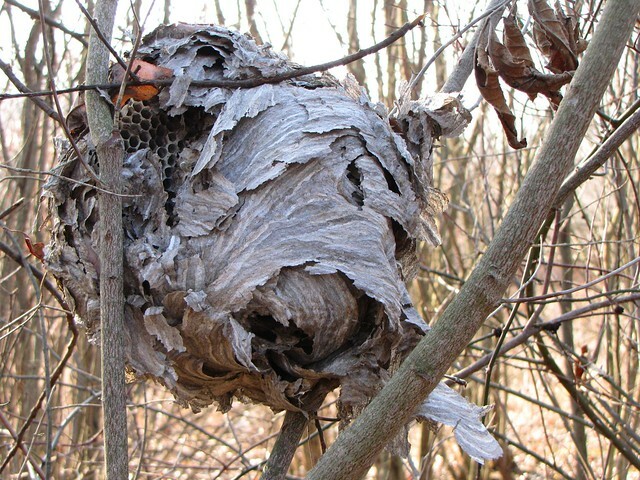 Bald-faced liars…er, wasps… built large paper nests during the warm season, as do all yellowjackets, but they build their structures in exposed aerial situations suspended from tree limbs. Other ‘jackets create their paper nests in underground or between-wall locations. In other words, if you can actually see a roundish gray paper wasp nest then it is a Bald-faced edifice. Bald-faced yellowjacke…er, Hornets build their reverse teardrop shaped nests out of a unique form of wasp paper. Wood pulp is chewed, mixed with saliva, and applied in semi-circular patches. The interior of the nest is hollow and contains suspended combs in which the young are reared. The new queen starts the thing in the spring and the later generations finish it. At peak activity in mid-summer the walls are multi-layered affairs that can be over two inches thick. Ignorant folk have long maintained that a thick-walled hornet nest is a sure sign of a bad winter. Sure as toot’n, they’d say. The idea being that the critters inherently know that a big winter is coming and can prepare themselves a “right nice cozy little home” in which they can brave the arctic blasts. Of course, in light of the fact that all the little critters are dead before winter even arrives, this is a tale that needs to die. There’s nobody home in a winter wasp nest except for a few homesteading flies or other small hibernating insects. The old nests fall apart over the course of the winter (see below), so they are not good winter shelters period.. (Note the use of the extra period in the previous sentence to emphasize the word preceding it). Even the wintering queens do not overwinter in their old nest. They seek protected places under bark, and inside hollow trees where they enter into a state of hibernation called “diapause” (a condition completely un-related to menopause, by the way). I spotted one of these potential ice queens clinging to the side of my house during one of our recent chilly days. Her wings were neatly folded into a position reminiscent of the pose she will assume when passing the long cold season. She moved away from the spot when the next day crept into the upper 50’s. “Swallowing the Nuthatch” sounds like one of those euphemisms employed to describe another event in the same vein as “Seeing the Elephant” or “Pushing the Envelope.” But, in this case, it serves to describe something that nearly happened – I did nearly swallow a nuthatch. To be specific, the nuthatch in question was a Red-breasted Nuthatch. It was an unusual thing, to be sure, because I rarely see this diminutive species in my yard (the White-breasted variety are far more common around here) and even odder that I came close to receiving one in my mouth! I was taking out the trash – a task that led me out the front door and through a narrow space between the front corner of the house and a large cedar bush. It was at that point when a grayish blue blur whizzed past and perched on the cedar branch only inches from my head. We eyed each other for a second before the startled bird launched. I instinctively ducked as it whizzed over my head and landed on a maple tree branch about twenty feet away. It was only after the bird landed on the distant perch that I was able to identify it as a Red-breasted Nuthatch. A black line through the eye, a rusty breast, and a series of “tin horn” toots confirmed the I.D. The question that remained, however, was the reason why the little ‘hatch was on that cedar bush to begin with. Like their larger White-breasted cousins, Red-breasted Nuthatches spend most of their time working up and down tree trunks and large branches. 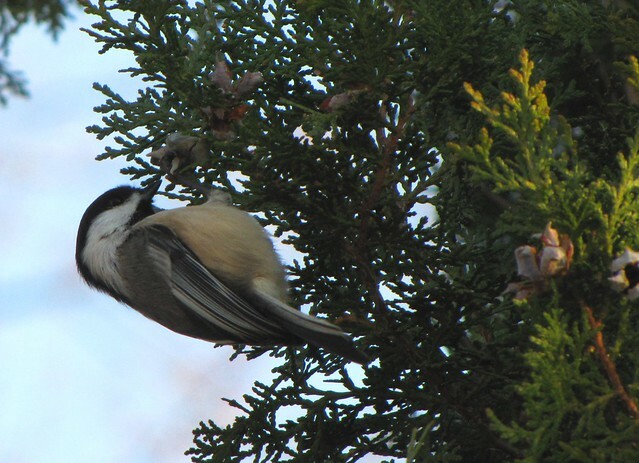 A bunch of Black-capped Chickadees were flitting around the same cedar on that morning and they eventually provided the answer. I watched and waited for several days after that incident in order to see what the birds were doing. The Chickadees were more than willing to show me (the traumatized Nuthatch was never seen again). The tiny birds were landing directly on the tiny cones, probing into the open scales and extracting sizable seeds. I’ve always liked my Cedar bush/tree. It is not especially attractive and was planted in the wrong place by the previous owners. But because it serves as winter cover for many local birds, and remains vibrant green throughout the long winters, it has remained. I’ve always assumed it to be a Northern White Cedar. As a naturalist, I should have paid more attention. This year the tree was having an especially productive year and was covered with hundreds of cones. 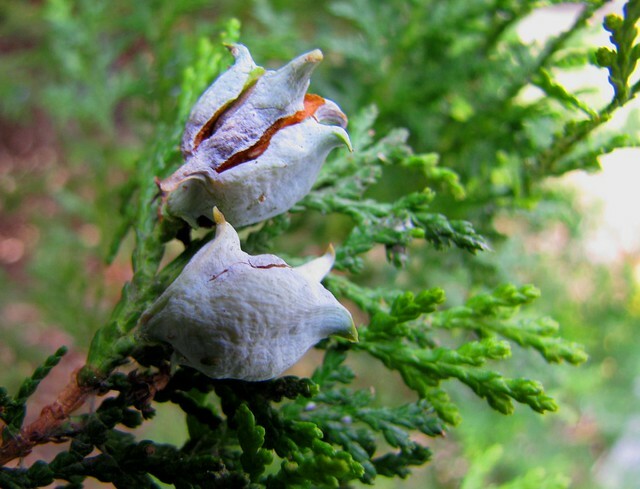 Wild White Cedars have very small cones- less than ½ inch in length and are covered with papery scales. I did notice that the cones on my cedar were heftier than the wild ones, but I chalked that up to the fact that I said hello to it every morning. A closer examination of the cones, prompted by the Nuthatch incident, revealed that they were very different from those on the native wild trees. To begin with, the cones were distinctly bluish and each scale was endowed with a prominent spur. They were opening naturally in the late fall air and, although most were emptied already by the feathered clan, some still had their cargo of oblong seeds. Considering the size of the cones, these seeds were quite large (about ¼ in.) and were un-winged. 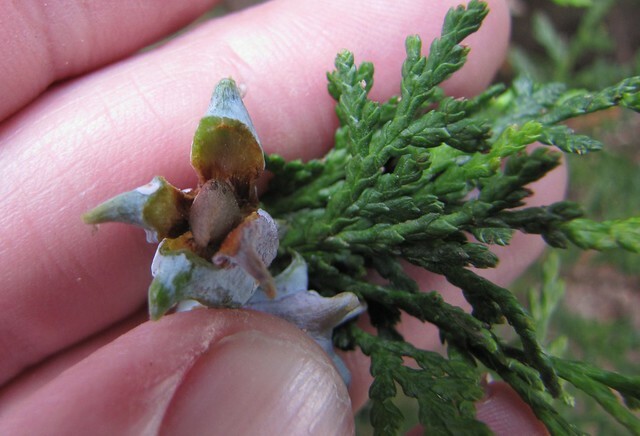 Northern White Cedars have two small wings attached to either side of their much smaller seeds. I popped one of them in my mouth and found it to be nutty and refined in taste (like pine-nuts). If it was good enough for a nuthatch or a Chickadee it was good enough for me. Of course these same critters also eat maggots and caterpillars I am not tempted to take this comparison any further. While munching I was forced to consider that this was not a White Cedar. To save you the process, let me simply state that this bush/tree – my bush/tree- is a Chinese Arborvitae. A native of Asia, this species is commonly planted as an ornamental because it never attains any great size (ohhh, so that’s why my tree hasn’t grown much in the last two and a half decades!). 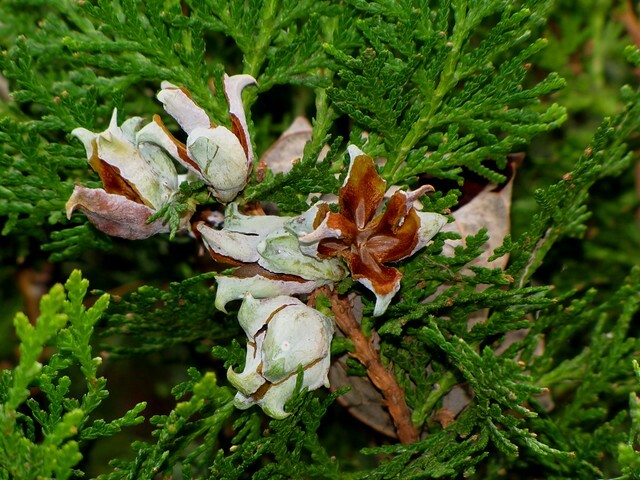 They are related to our White Cedars and share with it a common group name of Arborvitae. This is a term that means “Tree of Life” and given the context of this blog, I find this a very appropriate term. The addition of a wildlife food value to the list of this tree’s benefits has cemented it’s value in my mind. I learned several things this week, not the least of which was discovering the secret of a bush/tree that has been in my face every day for over twenty-five years. I also found out that my Naturalist instincts were not working as well as they should. But, there remains one un-answered question. I know what a Chinese Arborvitae seed tastes like but still wonder what a Red-breasted Nuthatch would have tasted like. 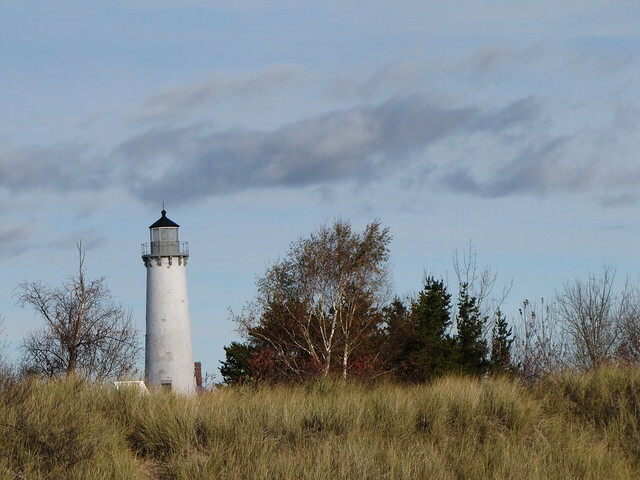 During the early fall migration season, the Lake Huron lakeshore at Tawas Point is a hub of birding mania. Their presence is a brief uptick in a season of fading tourist interest. By the time the biting late October/early November gales begin to whip the angry waters into a froth, few human visitors venture out onto the dunes. Those that do manage a visit do so because they appreciate the starkness (or the lighthouse). There is nothing quite like dune country during the cold season. It is not barren, however. Life simply switches gears. As one of those frigid visitors I wandered the shoreline recently – fully coated and hatted but stupidly un-gloved. There was a cold wind blowing in from the west but blue skies and puffy white clouds tempered the scene. In the interdunal spaces, protected from the wind, a few green things were stubbornly clinging to their colors. 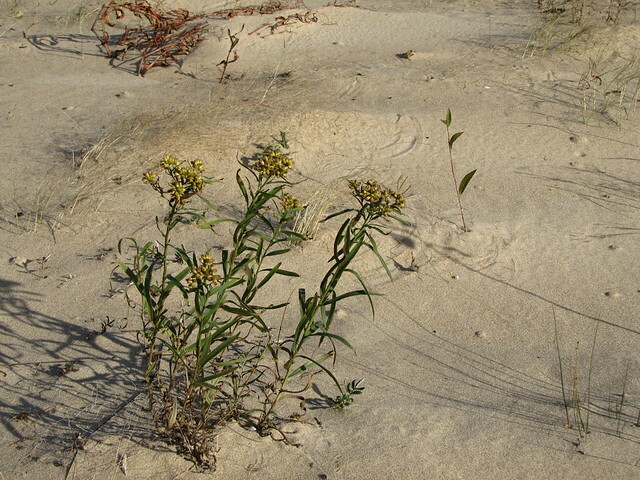 A cluster of Ohio Goldenrod (see below) and an etch-a-sketch blade of dune grass contrasted with the pale sand. I have to admit, the only reason I took the shot of the goldenrod was because I initially thought it to be an example of the threatened Houghton’s Goldenrod, an endemic plant of north Lake Huron shores. Afterwards, in spite of my best efforts and facing the reality that the species doesn’t quite extend down the shore to Tawas, I switched my identification to the far less exotic sounding Ohio Goldenrod – another dune species. 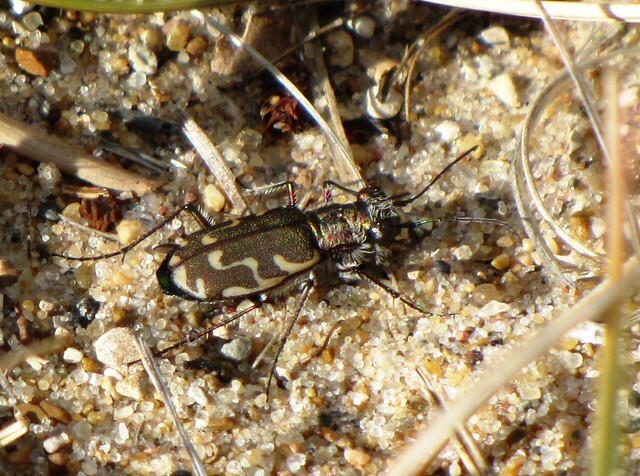 Numbed by the cold, a Tiger Beetle was forced to pose for his portrait. They rarely sit still and almost never allow for a close approach. The shoreline varieties are brown, as opposed to the bright neon green of the inland species, so they blend into their environs perfectly. Even in a closely cropped photo this individual is hard to spot. Due to a combination of winds and seasonal low water the end of Tawas Point was fully exposed. 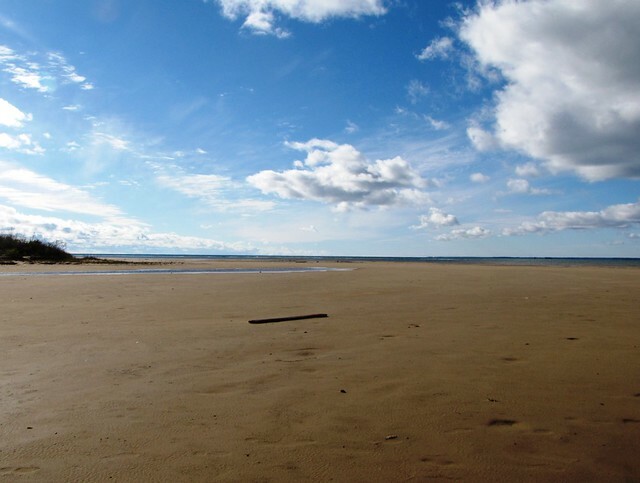 An open sand flat – punctuated by a few chunks of shipwreck wood – presented a scene of small drama. Balls of tannin foam created by the choppy waters of the bay, occasionally escaped the waterline and rolled across the sandbar like snowballs. A lone Trumpeter Swan performed solo honks just offshore. She was perturbed by my presence and soon lifted off to join a cluster of Ring-billed gulls perched on a distant sandbar. 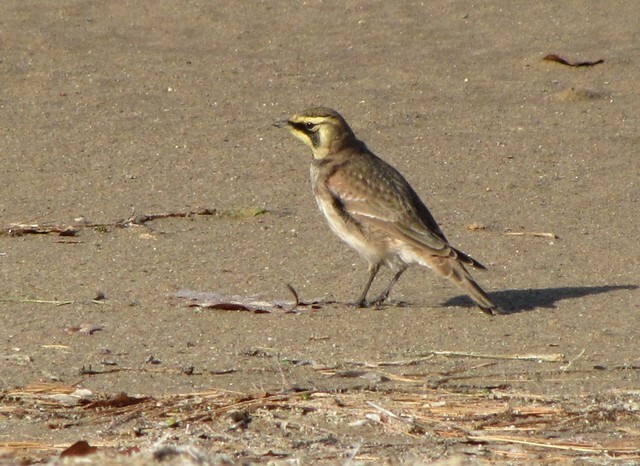 The only other truly active company I had out there, apart from the aloof swan, was a foraging Horned Lark. Birds of open spaces and low grass fields, Horned Larks are the only members of the lark family found in North America. Because this bird spends so much time in open shore environs they are commonly called Shore Larks in Europe. 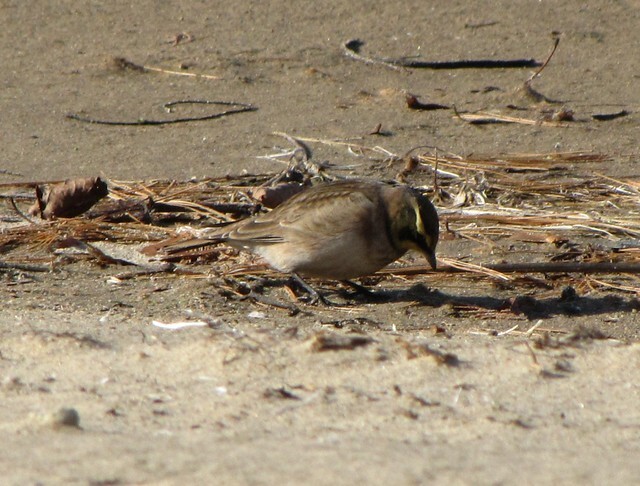 My companion was picking through the flotsam for seeds and insects. 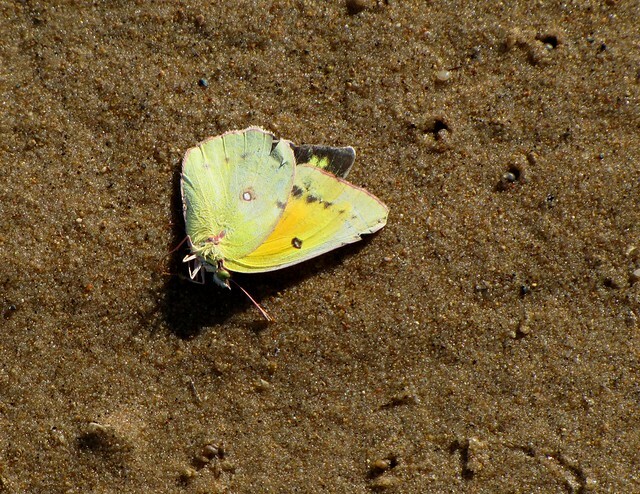 Like all the life that was moving over the flats, he too (it was a male with clear facial markings) was leaving tracks. Not only did the sign show it’s waddling manner of searching but clearly showed the long hind claw that is typical of the larks. It is called a Larkspur and some of you botanists out there might recall a flower of the same name with a long projection similar to the bird’s toe. You know, that last fact might be interesting when relayed in a warm house issuing from the screen of a warm computer, but imagine how fascinating it would be when standing in a bitter wind and turning larkspur blue. The small drama, as I mysteriously stated previously, involved hundreds of horn snails in a pickle. Like I said, snails in trouble qualify for “small” drama – no one can hear the screams of a thousand mollusks. 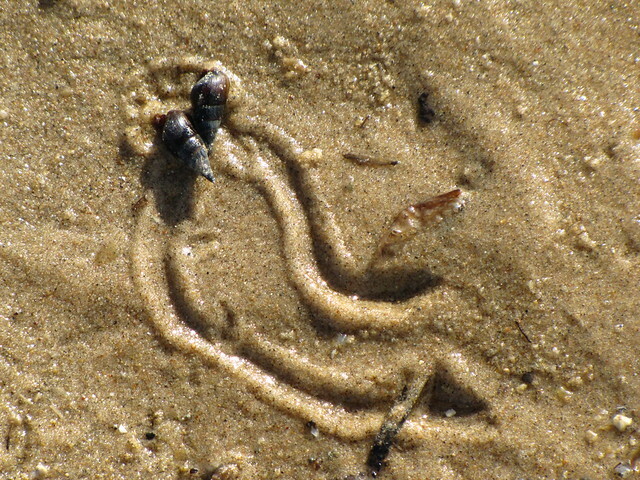 Normally content with feeding over the submerged sand bottoms, these snails were desperately seeking refuge in the scattering of tiny puddles that remained. These puddles were rapidly disappearing and clusters of the shelled refugees were clinging to them. 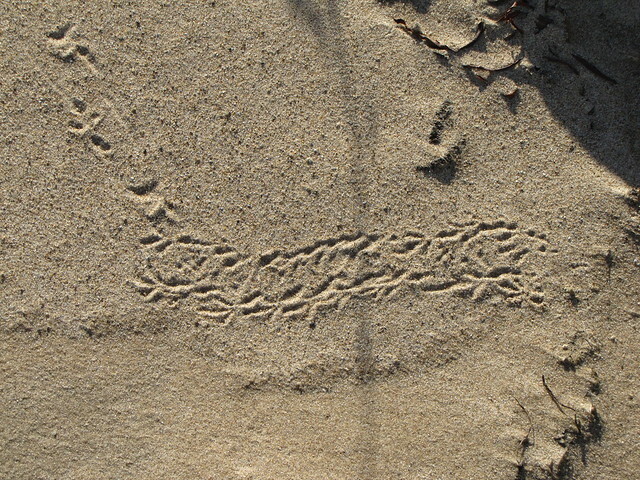 Recorded in the sand, their travels over the previous few hours were recorded as a series of artful lines. The snails were not willingly creating art, mind you, that perception comes from the large gloveless naturalist that stood over them. 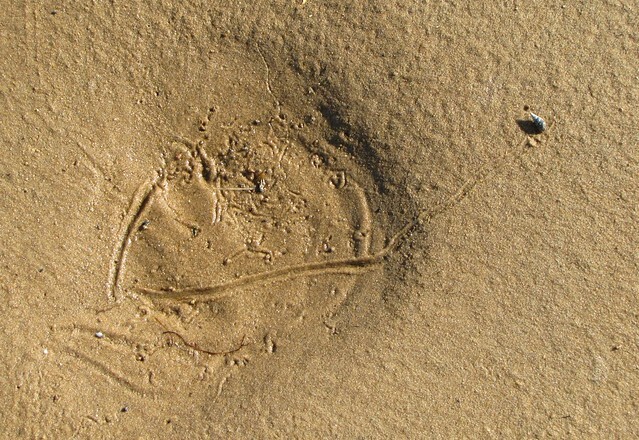 My tracks were wandering over the sand flats just as randomly as theirs. At one point, two snails appeared to be involved in an accident as their paths converged and they were in the slow motion process of heaving insults at one another (h e y w a t c h i t b u d d y . . . w a s y o u r m o t h e r a c l a m ?). Another’s path revealed a desperate attempt to break free of his shrinking pool – only to be stopped in his tracks by the chilly weather. Now, before we get all weepy-eyed about the fate of these fellows, I remind you that such critters are adapted to the variable nature of the shoreline shallows. Equipped with an operculum – a front door so to speak – they are capable of shutting the hatch and sealing themselves off from the cruel world. 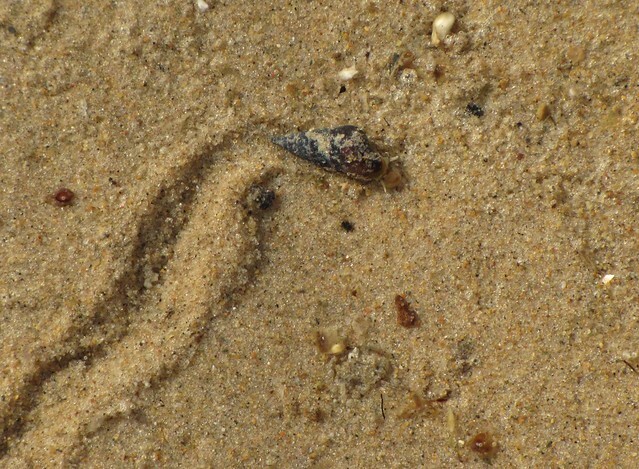 A large number of them ended up burrowing into the sand where they should be safe until the water returns. If the water doesn’t come back before the next hard freeze then many of these snails will not make it, but let’s not dwell on that. I don’t think snails realize they are dead until nearly 3 hours after the fact anyway (“H e y I a m d e a …).